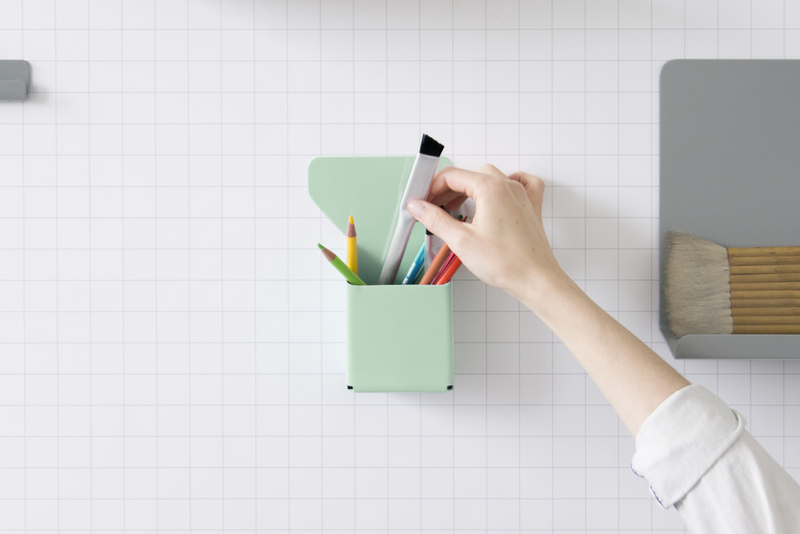 The Polarity Collection is a line of accessories for the workplace. The project is designed to highlight Visual Magnetics' InvisiLock technology, a powerful feature allowing 3D objects to be mounted to the wall surface using interlocking magnetic polarities. The pieces work in conjunction with this technology to conveniently eliminate the need for any hardware. The accessories sit freely, yet locked onto the wall surface, and held horizontally by the polarities. The collection takes reference from shapes of files and folders, borrowing from their iconic and functional forms. The user-friendly system ensures a perfectly straight application and allows for endless reconfigurations. The design uses sheet metal like paper, folding up to make three dimensional forms that are dynamic and useful. The Polarity Collection is made up of two shelves, paper displays, marker holders, solo magnet, catch box, and dry eraser. The collection is intended to work in tandem with Visual Magnetics' new line of writable wallcoverings, integrating the brand’s signature magnetic materials with multi-layer dry erase capabilities. Visibility is an industrial design studio based in New York City.